OMG, We Have a Floor! 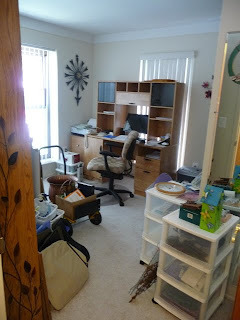 Not too often in the organizing world do you come across a husband who declares their home has "just too much stuff with no where to put things." Not to say there are not men out there who are for being organized, just speaking in general terms fellas. 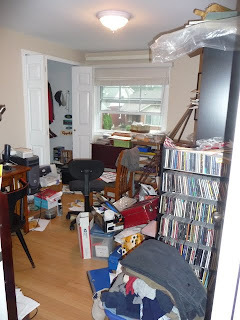 "Jim" wanted to conquer his family's home office and get a grip of what it has evolved to be ... a big, gnarly, mess. 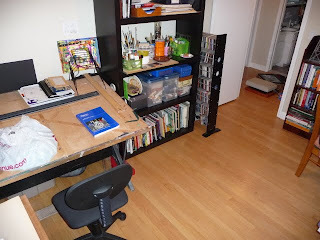 From stepping through the doorway around the piles of books, over the art supplies, tip-toeing through the magazines/mail, the time had come to get this family's office into shape! 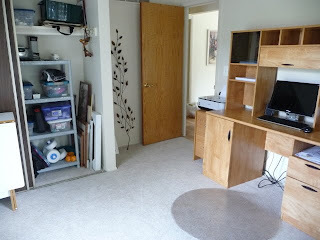 Jim had his area from the closet out and his wife, "Lilly," area was from the art desk to the door. Both worked at sorting out what they REALLY needed and what needed to go ... um, trash. Jim declared he was not happy at all, "I'm feeling frustrated," he stated. Lilly and I encouraged him on. He was doing a great job of letting go of many papers and such. Then Lilly hit her wall, "I just can't let go of this stuff." Jim and I then helped her decide what she could let go. When organizing, you may hit points like these along the way. It is always important to acknowledge your feelings, as well as, those you are working with. Your partner may not agree with you, though expressing an understanding eases the stress and helps the one struggling to continue to reach their goal. Soon, Jim and Lilly's office began to come together. Art supplies were ready for use on the shelves instead of the floor, the art desk was cleared for projects, papers were filed and many were ready for shredding. The closet door now closed with plenty of room to consolidate Jim's clothing into one closet rather than two. The tranformation of this office in such a short period of time (4 hours). Jim and Lilly have a gameplan to file their paperwork, avoiding stacking everything. Lilly has a great area to work on her drawing and painting projects. Her art supplies are easy to find on the shelves in clear bins. The floor was swept and now shiny clean! WOW!! Now that their home office is back to a clean fresh starting point, Jim and Lilly will feel motivated to keep it this way. Overtime items may drift out of their homes. You just need to acknowledge when you feel this is starting to happen. Take a moment and plan the time on your calendar to bring your area back to happiness. If you do this periodically, you will always feel good about your home. What floor in your home has been lost? "Help me, I'm lost in my own office." We've all felt lost at some point in our lives, sometimes everyday. Though in your home is one place you do NOT want to have that feeling. Your home should give you a sense of peace and solitude. A place to recharge, entertain and relax. If you are getting some negative vibes from your home, you really need to do something about it ... Stat! "Mary" was feeling lost in her home. Moved into her new condo about 4 years ago and never quite settled her home office area. Items were kinda just tossed in there until a better spot was found for them. Mary really wanted to focus on getting her office are whipped into shape. As we walked into her office, immediately I noticed Mary's window was blocked by her desk. 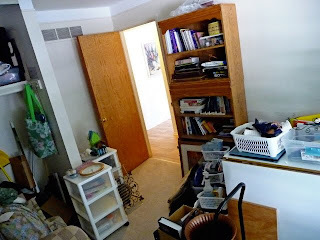 Then having to step around storage drawers at the doorway, only added to the poor energy flow of the room. 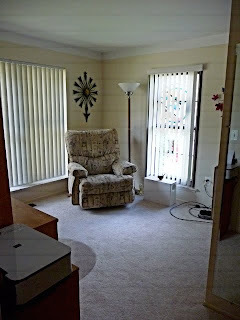 Now, I am not a Feng Shui expert, though this room was in need of a boost in its energy mojo. Mary and I began to pull all the items we could out of her office. Then move her desk to the opposing wall. This opened up her window and allowed a wonderful sitting area in a big comfy chair. 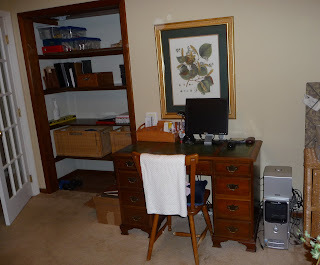 Mary's desk, bookshelf and filing cabinet were moved to one wall and grouped together. Placing these items here is great because her back in no longer facing the entrance to the room (back to room = bad Feng Shui). Many of Mary's "extra storage" items were loaded up into her car for donation. She ended up with a car load of stuff. Items that did not belong in her office were taken to their proper home. "Holy mackrel! This is AWESOME!" Mary's office sure did feel a whole bunch better. Best part is Mary is motivated to keep her organizing projects going. I encouraged her to schedule her next projects on her calendar, just like she did with our appointment. By blocking off the time, you create a commitment to yourself. Also, make sure the projects are small enough you can complete on your own. You do NOT want to get frustrated by biting off more than you can chew. You'll just end up gagging and may quit the whole organizing process. That would be a bummer. Pick a few projects around your home. Schedule to get to work on them. Then, remember to reward yourself when your finished. What area of your home is giving you some bad vibes? Ben Trovato, Officemax ... Bravo! Happily invented that is the italian translation for ben trovato which is perfect for this great piece of furniture Officemax has designed for you. Designed for your home, the Trovato Office-in-a-Box is perfect for tight spaces. Measuring 36" wide by 24" deep it is just enough to create a work area for your bills and mail center. The rich espresso brown finish provides a durable stain and scratch resistant finish with style. The three-piece set includes a compact desk, a removable hutch with compartments for office supplies and an ottoman with a padded seat that has room inside to store file folders or other papers. Bravo! Officemax for making this product available for about $150 with free shipping to most areas. 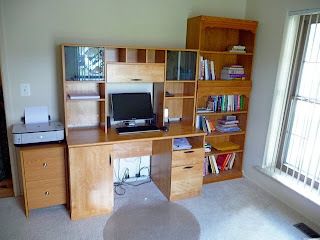 Trovato Office-In-A-Box is a great piece of furniture to begin your quest to have an organized home office. What is your favorite office organizing item? Impromptu hugging took place at the Toledo Zoo's Rock n Roar. We were hugging all that entered the event, then made our way around enjoying all the live music and dancing. Made a lot of smiles that night. 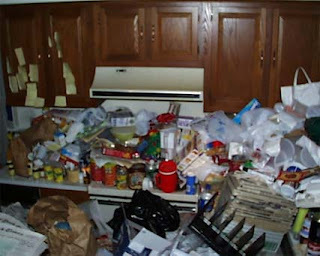 Hoarding is the acquisition of, and failure to use or discard, such a large number of seemingly useless possessions that it causes significant clutter and impairment to basic living activities such as mobility, cooking, cleaning, showering or sleeping. 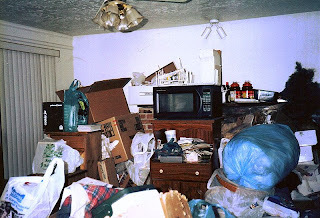 A person who engages in compulsive hoarding is commonly said to be a "pack rat", in reference to that animal's apparent fondness for material objects. 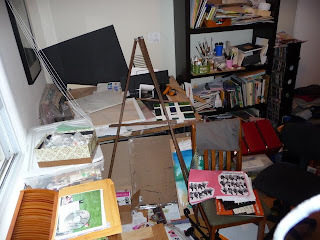 As a hoarder, you may mistakenly believe that the hoarded items are very valuable. You may show off a cutlery set claiming it to be made of silver and mother-of-pearl, disregarding the fact that the packaging clearly states the cutlery is made of steel and plastic. You may have a refrigerator filled with food items that expired months ago without ever eating them, but would vehemently resist any attempts from relatives to dispose of the unusable food items. A&E has a new short series entitles "Hoarders." This series is a fascinating look inside the lives of two different people each week whose inability to part with their belongings is so out of control that they are on the verge of a personal crisis. "Tell me about this space," is a similar request that I ask all clients before starting a project. Forcing a change on someone is far more effective if you know what their objectives are. 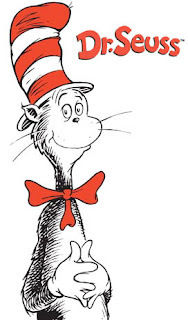 If it has been a few years since you have been invited into a loved one's home, please, PLEASE find a way to weasel your way into their home and check it out. Gather up your family and friends and help those in need. Who have you not visited in 2 years that you should? Hey, we all feel a bit kicked and strampled at times. Let's pull together and find out what lies ahead. There I said it and don't even say you have not thought this during at least one of your moves ... if not every single one. No matter how long you have lived in your current home, moving takes so much time and energy whether you hire movers or not. You've got to sort through the stuff to take and stuff to trash/donate/leave behind. Everything has to be boxed up. Your home becomes a warehouse setting with stacks and stacks everywhere. The day of the move all your items are carried into your new home and stacked ... again ... everywhere. UGH! Soul had me help her and her family get ready for their move back in June. That was a big task and we successful accomplished it with ease. She now asked me to return to help UNPACK from their final move. Boxes stacked everywhere. Not quite as bad as our June project, but the goal was to get Soul's car parked into her garage and out of the hot Texas summer sun. With the music jammin' we went to work, grabbing boxes and slicing them open to see where they belonged. I carted them into their home to the room the items belonged. Items for her husband to sort were set into his boat. In under 5 hours, everything that needed to be in the house was in the appropriate room. Many of the boxes were broken down and packing materials boxed up. A free listing on Craigslist had someone at the house within hours to take the majority of boxes away (yeah no landfill use). Best part was seeing Soul park her car in her new garage. We spent much of the next days sorting and finding homes for many of the items inside Soul's home. It's going to take a bit longer before all the boxes are gone. Working on 2-3 each day is very managable. Soon, everything is in its place for hopefully many, many, many years. How would you describe the moving process? I'm feeling the need to kick this funk out of my head. Join me in getting this party started! Whatcha doing today to make it great? Use Me and Spin Me ... It's Friday! Hope you take the time to dance like a fool. What two songs get you jammin'? Being organized is an on-going battle. As time passes, items tend to drift to new areas. It’s not their home, though they sure to seem pretty comfortable and happy. -You purchased a new phone and the box and packaging are hanging out on top of your printer. -Papers are slowly accumulating on your desk top: one stack for bills, one for stuff you need to do and other of, well, anything goes with THAT stack. -You have paper clip boxes in 3-4 different drawers in your desk. You are an organized person, at least you remember being one. Just can’t seem to find the time to get it together again. Need a little nudge or maybe just a swift kick in the rump to get back on track. “Lisa” pretty much felt her home office had lost its way and needed to be brought back on track. Bills and statements had been collected for years that needed to be shredded. Old family paperwork needed to be looked at one last time before let go. And, a new game plan needed to be set for her household and office supplies. Quickly Lisa’s office began to resemble an area she remembered. Two bags of papers were ready for the shredder, two bags of stuff were sent to the curb and all her items were back in their homes. Her desktop is set up for weekly use. 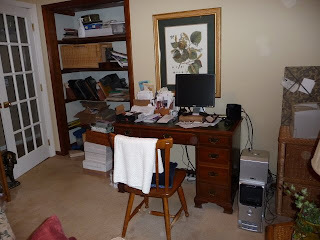 Lisa’s desk drawers have all her supplies and documents she would need or refer to every month, leaving her file cabinet and closet for long term storage and reference purposes. 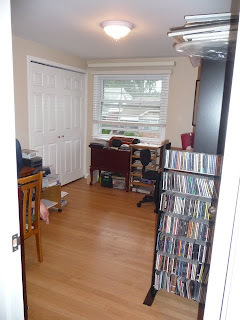 Lisa was pretty amazed how much better her office began to feel; “Now I feel I have control over this area again.” With her office feeling pretty darn good, she’s ready to tackle getting her pantry organized. As the saying goes, "Choose your battle. Win your war." 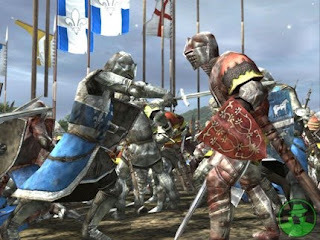 What battle are you choosing? Transitioning your older family member to a new home is a stressful time. They likely do not want to move. You want them to move for their safety and peace of mind. Then when moving day arrives, chaos can breakout at any moment. Everyone is working toward the good of their loved one. Your services are so VERY important to ease tension and stress which may avoid life altering accidents! One day "Bill's" family was moving his 93 year old--- YES NINETY THREE year old Grandmother to an assisted living facility/retirement home. She decided that she needed some extra assistance after living alone for the last 10 or so years, so she was putting her house up for sale and downsizing. They were doing great, Grandma was moving slower, but still getting around on her own. Certainly someone for us all to look up to and admire her strength! Finally she arrived at the assisted living facility and the family and her were unpacking boxes and it was all a little chaotic when BOOM went Grandma and fell down!! SHE BROKE HER HIP, just like that! After being in the hospital, receiving a hip replacement, going through rehab, etc...Grandma is finally ready to settle in back home...HOWEVER she is no longer in an assisted living place, she had to be moved to skilled nursing facility. Totally different. She never got to spend one night even in her assisted living/retirement place, which I heard was VERY nice. Her new "home" is in a totally different facility across town. Sad that this had to happen. If only they would have hired you for your services. If you find yourself in the midst of moving a loved one, please take care of their safety. When moving seniors, the best case scenario is to have someone spend the day with them away from the move. Take them out to breakfast/lunch, a movie, the zoo or a friend's home. Anything to keep them away from the moving activity. If this is not possible, most assisted living facilities will occupy the new resident while the moving takes place. Thank you Melonie for allowing me to share this story. What is your plan to move your grandma?